When the Northwest Extension of the Burkburnett Oil Field opened in 1919, Prospectors thronged this area. 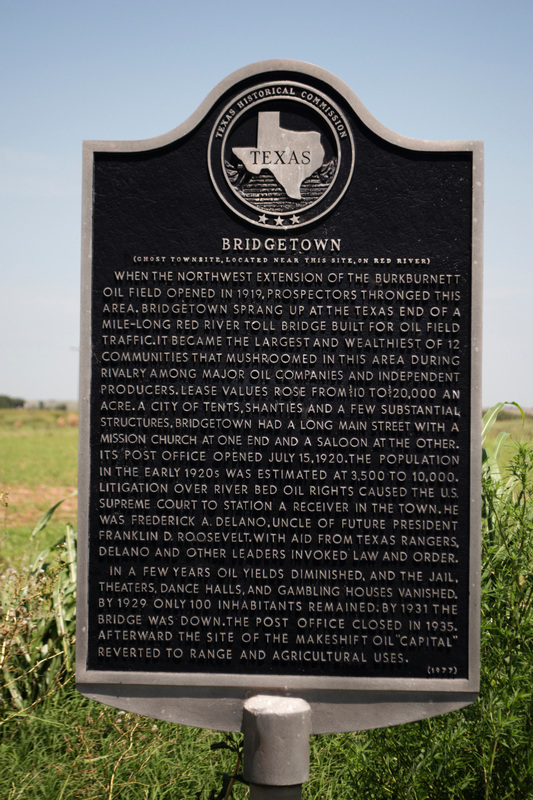 Bridgetown sprang up at the Texas end of a mile-long toll bridge built for oil field traffic. It became the largest and wealthiest of 12 communities that mushroomed in this area during the rivalry among major oil companies and independent producers. Lease values rose from $10 to $20,000 an acre. A city of tents, shanties and a few substantial structures, Bridgetown had a long main street with a mission church at one end and a saloon at the other. Its post office opened July 15th, 1920. The population in the early 1920s was estimated at 3,500 to 10,000. Litigation over river bed oil rights caused the U. S. Supreme Court to station a receiver in the town. he was Frederick A. Delano, uncle of future president Franklin D. Roosevelt. With aid from Texas Rangers, Delano and other leaders invoked law and order. In a few years oil yields diminished, and the jail, theaters, dance halls, and gambling houses vanished. By 1929 only 100 inhabitants remained. By 1931 the bridge was down. The post office closed in 1935. Afterward the site of the makeshift oil "capital" reverted to range and agricultural uses. Located on SH240 at the junction of Bridgetown Road, west of Burkurnett, Texas. GPS: 34-degrees 05' 48.2" N -98-degrees 40' 26.9" W.
​ For information about Bridgetown at the Handbook of Texas Online, click the button below.